Native to the Canary Island, these birds come in a wide variety of colors, fun watch and are great song birds. They make a great starter pet. 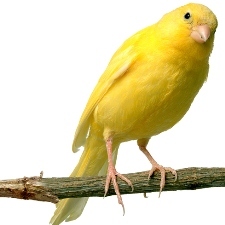 Canaries are the smallest bird in the finch family. In the wild this bird is greenish yellow over most of the body, but as pets they come in a variety of colors. They are fun birds to watch and to listen to, especially the males. They tend to be better singers than the females. Unlike parrots, these birds will spend most of their life inside the cage and get their exercise from moving about the cage. For this reason, it is best not to have their wings clipped like other birds. They’re lower maintenance than other birds and life span (approx. 10 years) make them suitable for someone that is new to birds They are also one of the few species that is not considered “social” meaning that a single bird can be happy. Probably the most important thing to consider when selecting a bird cage for a canary is providing them room to fly. They get their exercise flying back and forth inside the cage so it is always best if they have room to fly back and forth. Because of their flight patterns, length is typically more important than height. Most experts recommend the larger the cage the better. If you are able, consider a bird cage that is 24 inches long. At a minimum, look for bird cage that is 18” wide, 18” deep, and 24” high (or larger). Also very important when selecting a bird cage for a Canary for any small birds is Bar Spacing! Bar spacing that is too wide is dangerous. Look for cages with bar spacing that is no greater than ½ inch in size. 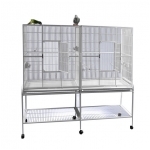 Finally equip your cage with a variety of perches in a variety of sizes, shapes and placements. A variety of perches help mix-up the flying patterns of the birds. Different sizes and irregular shapes help to exercise the birds feed. Toys like swings, bells, mirrors, etc. are great. Be sure they don't not obstruct flight. A shallow dish of water or special bath is important to regular bathing. - Canaries get their exercise flying back and forth, so room to flight room is important. - Bar spacing is important for Canaires and all small birds. Look for cages that has bar spacing no more than 1/2 inch in size. - A variety of perches helps promote foot strength.